Zinc ore collected in 1943 from the Rush Creek Mining District, Marion County, Arkansas. The brown mineral is sphalerite: an ore of zinc. 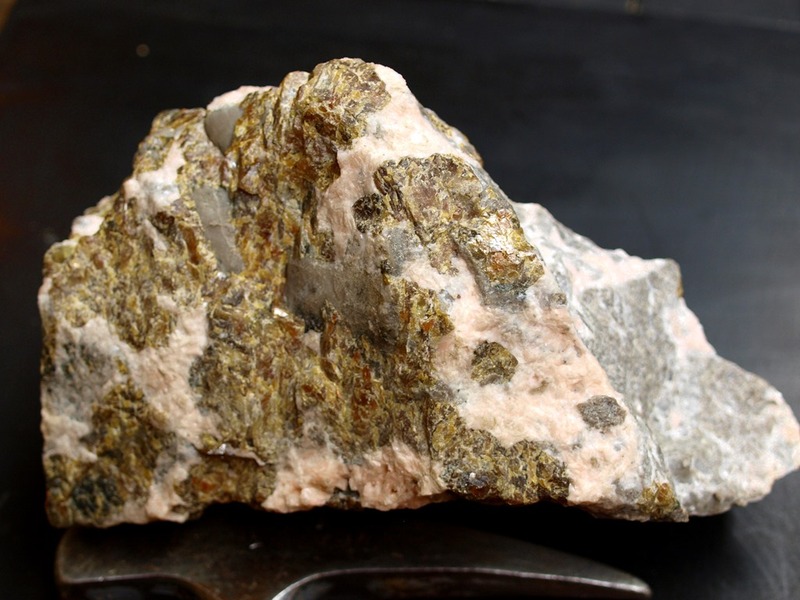 The pink mineral is dolomite – it’s pretty, but not economically valuable. They were both deposited on the gray dolostone; you can just make it out on the right, in back. Zinc deposits are found throughout northern Arkansas, commonly with the lead mineral, galena. They’re most abundant in Marion County, in a two mile stretch of rugged terrain, along Rush Creek, where 4 faults come together. That area was mined for lead and zinc in the late 1800s and early 1900s. It’s typical to find rich ore deposits in rock that’s been fractured by faulting. The fractures facilitate migration of mineral-rich ground water which deposits the ore minerals in the fractures. It’s hard to see in the picture, but the fractured dolostone rock, in this specimen, is bound together by the sphalerite and dolomite minerals. This entry was posted in #geoblog, GeoPic of the Week, Sedimentary Features and tagged Arkansas, Buffalo River, Dolomite, faults, galena, Geology, Lead, Marion County, Rush Creek Mining District, sphalerite, Zinc on February 10, 2017 by argeology. In September of 1982, this 800 lb. boulder was excavated by a backhoe operator during construction of the La Quinta Inn on Fairpark Boulevard (currently Day’s Inn), Little Rock, AR. Another worker on site recognized it as galena (ore of lead) and, wanting to score some quick cash, the finder began contacting local geologists, hoping to sell. Eventually, then State Geologist, Bill Williams, heard about it and sent another geologist from the Arkansas Geological Survey (AGS), Ben Clardy, to investigate. Clardy bought the boulder for $100 and the backhoe operator loaded it onto Clardy’s truck for transport back to the AGS office. At the office, an engine lift was rented to remove it. The agency’s chemist, Gaston Bell, assayed a piece for silver, determining it contained 1 – 2 %, making it high-grade silver ore. Feeling he had cheated the seller, Clardy contacted him with the results but the seller was happy with the $100 deal. The State Geologist reimbursed Clardy and placed the specimen on display in the lobby of the AGS office. News of the find spread quickly, as the story was picked up by local newspapers. Someone claiming to be the hotel property owner announced that the backhoe operator had stolen the rock and came to the AGS office demanding it back. It was now property of the state, but Bill Williams told him he could have it, as long as he could bring some large guys to carry it off; he didn’t want heavy equipment in the office lobby. The man left and never raised his claim to the rock again. A couple days later another piece was found on the property in the same mineralized pocket which was at the intersection of two quartz veins. The property owner took possession of that piece and sent it to Colorado where it was smelted and produced a substantial silver bar. Around the same time, as the public became aware of the find, some midnight rock poachers began sneaking onto the property, after hours. 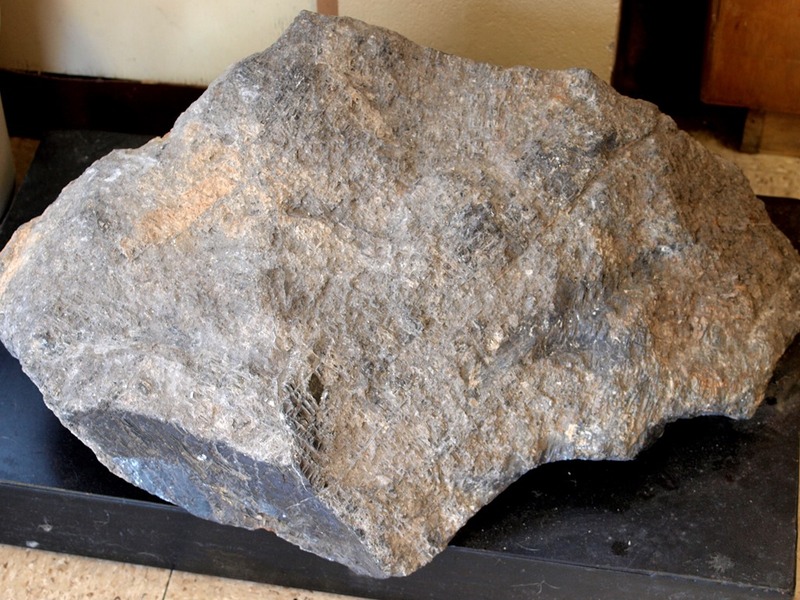 Small chunks of galena appeared around town for sale, being marketed as “Little Rock Silver Ore”. At least one silver company took an interest in the find, conducting a series of soil tests over several blocks surrounding the La Quinta property. They soon abandoned the effort due to the difficulty of mining in such an urbanized area. Results of their tests were never disclosed. Eventually, construction of La Quinta was completed, the lot was paved over, and thus ended the “Little Rock Silver Rush”. The original 800 – pound chunk is still on display in the lobby of the AGS office in Little Rock. Part of the other piece, which was not melted down, was displayed in the lobby of the La Quinta Inn on Fairpark Boulevard before the property changed hands. This entry was posted in #geoblog, GeoPic of the Week, Sedimentary Features and tagged Arkansas, Ben Clardy, economic geology, galena, Geology, Geology pictures, Little Rock, Michael J. Howard, mining, Norman F. Williams, Silver, state geologist on February 3, 2017 by argeology.